Short of being married to a dentist who can give your teeth tender loving care on the daily, the next best thing to ensuring you have the freshest breath is remembering to clean thoroughly twice a day. 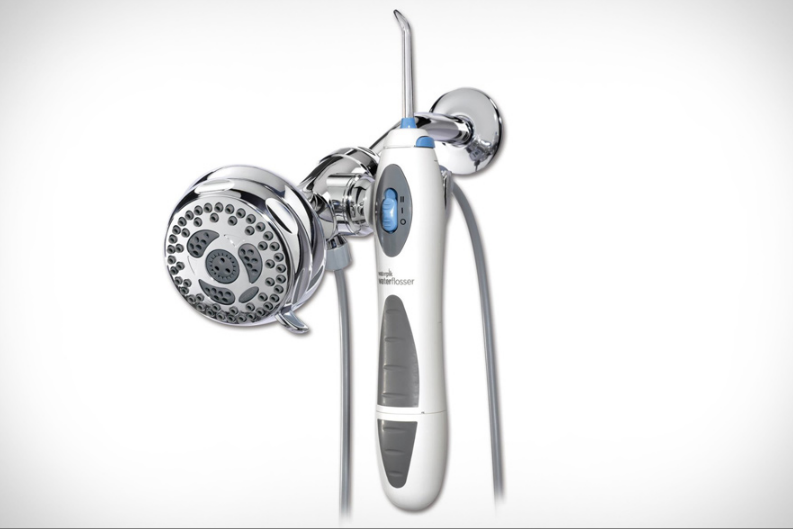 Since marriage has a 50 percent rate of failure, instead of banking on marrying a dentist and stay married to him/her, it’s probably easier to just invest in the Waterpik Showerpik. Sorry to be a party pooper, it’s just statistics. It may sound a little intense, but the device looks pretty cool. Billing itself as a “water flosser” (because regular floss is time consuming and gross), the Waterpik WP-480 uses pressurized stream of water to help give your mouth a supercharged rinse. The water pressure and pulsation is designed to clean off remaining bacteria left post-brushing, and is meant to be installed right in your shower so you can get your morning routine done in one fell swoop. Because it’s attached to your shower head, the water supply is as unlimited as long as the water bill’s paid and users won’t need to constantly refill a reservoir. The device is rechargeable so no batteries are necessary, but you’ll have to remember to keep it juiced up so it won’t die in the middle of a wash. Oral irrigators are effective in reducing gum disease and gingivitis. The design of a pressure water gun can also be useful in random other utilities, such as cleaning small jewelry. Just don’t drop it down the drain! The Waterpik is available now for $60. It does come with a tip cover to keep the mouthpiece clean, but you’ll wanna rinse before use if it is going to be shared between housemates, or buy separate heads. Brew professional-style espresso drinks and become the envy of your neighborhood with one of the best espresso machines on the planet. We have options across a range of price points, perfect for any budget.